Some days are just plain tough! Those we care about are hurting. Our plans are falling through. Our prayers seem to bounce off the ceiling and fall at our feet. We cry out to God  sometimes in anger, sometimes in desperation, but especially for mercy. We need relief! We need hope! We need the Father to respond. 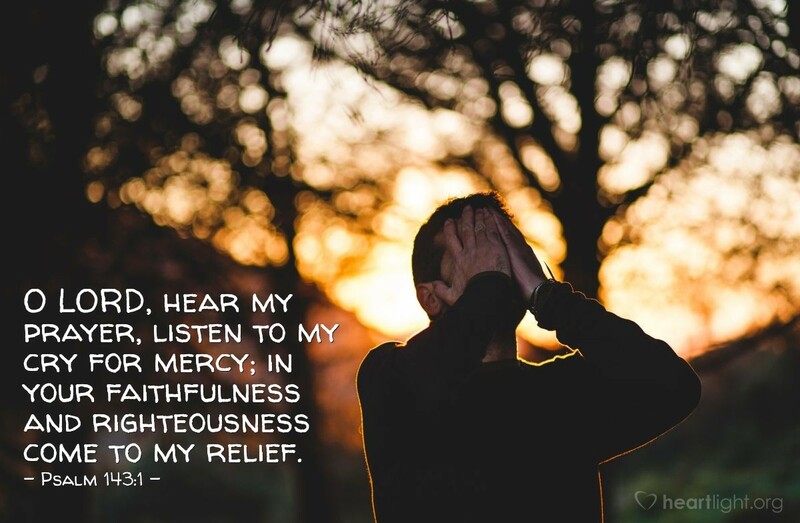 Faithful and righteous God, loving Father, please come to my aide and bring me relief from my struggles with sin, with disease, with discouragement, with friends who are untrue, and with enemies who work for my humiliation and destruction. I need your help. I need your mercy. O, dear Father, I need to know your presence and power in my life today. In Jesus' sweet name I pray. Amen.